An overview page of all Dynamic Applications, along with a very short, precise description of functionality for the facts, decisions and structure oriented visitor. Dynamic Applications. Cost/Profit planner for a Small Business with 3 product lines. All our products are free of charge, except for Perfect Desire, our professional Business Model Development Environment, which comes with formula editors activated by default. Upgrades for all products are posted in a 2-4 week schedule, and they are free of charge. See our Release Notes page for detailed information. Latest version is exclusive to this website. If you like our software, say thanks and buy a Windows 10 Store App after one (1) year. We’re always so very grateful for a 5-star review. it helps a lot. click here to enlarge the Product and Feature Matrix picture. 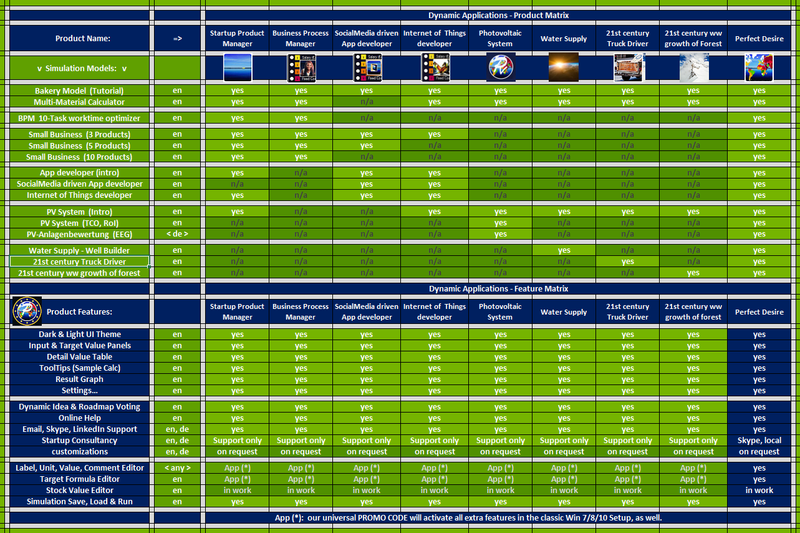 The Product Matrix shows the Simulation Models which are included with a product. The Feature Matrix shows the Platform Features that all our products bring with them. Startup Product Manager. Your free interactive 48-month Business Planner. Enter anything from Employees, Work Time, Fixed Cost, Materials, Energy, Production Time, Customers and Sales expectation. See your monthly income on the spot. For each Input Value, now estimate its development over 48 months. Startup Product Manager will calulate the median statistical forecast of all your estimations, graphically displayed. Startup Informer. Your personal assistant, an automated SocialMedia manager. Startup Informer will read the Sitemap of up to 3 Websites or Web Pages and start tweeting about your business, informing your personal fan crowd on latest proceedings. Create interactive content by mixing in Tweet of your personal Friends of Team members, Newstickers, Famous Quotes, or license free imagery. Startup Informer will curate your best tweets, as voted upon by your followers, and repeat them once in a while. Everything is fully configurable through a graphical settings menu. Photovoltaic System allows you to enter typical PV System parameters such as Number of PV Panels, Panel Capacity, House Angle and Slope, Sunshine hours per Year, and your basic Network Electricity buy-from and sell-to prices. From there, Photovoltaic System will calculate Installation Costs, Total Costs of Ownership, and Return on Invest over time. Estimate Maintenance Cost, changes in Network Electricity Cost and Regulation, Self Consumption Rate, or even the change of comsumption of your own household, should you plan for children. Photovoltaic System will tell you what that means, in Euro. All results are graphically displayed and give you an easy to understand overview. SocialMedia driven App developer. Sell a Product with 0 material cost, worldwide. SocialMedia driven App developer will caluculate an App Developer‘s 21st century business in estimating work time, fixed cost, downloads, and sales. Through SocialMedia followers, Backlinks and typical conversion rates even for sales from downloads, SocialMedia driven App developer allows you to forecast even the number of visitors on your own website, your entrance to the world of 21st century suppliers and entrepreneurs. Internet of Things developer. Calculate Devices for the Internet of beautiful things. Internet of Things developer offers all the functionality of the SocialMedia driven App developer, plus offering additional fields for material, energy and production cost. Calculate worldwide deployment and expansion with your device for the Internet of beautiful Things. No need to have WiFi connected from day one. While others keep playing breakout, you’re playing the game of your Lifetime, day by day. Are you ready to grow? Business Process Manager. a simple, 10-step Business Process and Task optimizer. Business Process Manager is our solution for people in the Service and Consultancy business who are producing no physical goods. Enter up to 10 typcial tasks of your work day, as well as your service offering pricing and number of customers, and Business Process Manager will tell you what’s reasonable to assume within 48 months. Perfect Desire includes all our simulation models, and offers the built-in formula editors that are exclusive to the professional version of Dynamic Applications. They are based on our Universal Equation Solver engine, allowing the whole formula system to be developed from within the application. Perfect Desire will inform you where and why your formula system can not be resolved. And so, it adds self-healing aspects to the full Transparency approach. Create your own Dynamic Applications, and publish them on the International Network, free of any additional charge (Sales Flatfrate). Perfect Desire can create simulation models that can be loaded from any other Dynamic Application, and it includes the Dynamic Applications Business License for year one. Perfect Desire comes at an exceptional Price of 25 Euro per Person per Year. You got a plan? – here’s the perfect tool to prove right that, to everyone. any model. all features. no limitations. Water Supply chain shall be the most basic Dynamic Applications of all. It includes the Well Builder simulation for the typical House owner. It will calculate Time, Depth, Effort and Volume of your personal Food and Drink supply. To accomplish for supporting your own family, the Water Supply product contains an additional simulation model that calculates the energy that can be stored in a Water Cylinder, as well as the Multi Material Product calculator and the Bakery Tutorial. Food and Drink – Water Supply has Dynamic Applications’ most basic answers. In an attempt to sort human values, Beware of BASIC rules of humanity language. Tick Tock, bye bye, be ware of wolves, we say. 21st century Truck driver. Sells his house, buys old Truck, makes windows, and drives on. The 21st century Truck driver simulations calculates how far you can go if you sell your house, buy your old Truck, settle a freight container, paint, make windows, and drive on. It’s the winner of our 2017 Dynamic Idea competition, based on your public vote. available today. 21st century worldwide growth of Forest. an introductory worldwide CO2 simulation. The 21st century worldwide growth of Forest simulation will estimate the total amount of Forest and Woods on this planet, by continent. Starting from today’s Stone Coal, Brown Coal, Oil and Gas deliveries, 21st century worldwide growth of Forest will estimate not only the rising CO2 levels in our global atmosphere, but also allow you to estimate rising temperature and rainfall. Everything can be customized according to your needs. Ever wanted to understand how difficult, if not impossible it is to be a reliable climate researcher? – here you go. The Federal Press Agency is our prototype of a democratic news agency. In being a spin-off from Startup Informer, it alles everyone to inform their personal SocialMedia fan crowd about latest proceedings. The Federal Press Agency SocialBot will evaluate and Tweet regularly not only your Website’s pages, but it will also mix in content from other sources, fully configurable: your best own Tweets, your Friend’s best Tweets, your Team Members, and any kind of Newstickers you may find helpful. Selection of Tweets will be so that the Tweets most popular by public vote (Retweets and Favs) will be presented most often. The Reverse Experience. our introductory strategy scenario game. Think far ahead. The Reverse Experience is a Reversi / Othello Board Game Player that includes detailed statistical analysis of a computer’s way of thinking. Based on the MiniMax algorithm of Search Game Theory, The Reverse Experience will allow you to select from a large variety of Reversi Player Strategies for the computer player, and climb your way upwards as you manage to beat one strategy combination after each other. Published from day one, The Reverse Experience is a long-term hobby project of the Founder of Dynamic Applications. Think far ahead of Time. And how to learn that. All Windows 10 Store Apps come with full functionality, including the Target Formula editor system. So there’s no need to apply Promo Codes to Windows 10 Store Apps. All Windows 10 Store Apps are able to load and save all your simulations, available in the universal standard XMILE format for Simulation Models in System Dynamics. Unlimited License for all Windows 10 Store Apps, including Unlimimted Upgrades. All Products are Adware and Spyware free. No data gathering, no Server behind you. Your business is private and safe. System Requirements: Windows 7 / 8 / 10 with .NET 4 Framework (included). We believe in happy customers being the base of any long-term success. Everything is free. If you like it, please buy a Windows 10 App after one (1) year. All Windows 10 Store Apps include full Target Formula editor capabilities. For Win7, free Promo Codes can be found in the Dynamic Idea and Roadmap competition. Dynamic Applications. Business Model Tutorials. Our introductory, free Business Model Tutorials for Startups, Founders and Foundresses are available right through the Software’s Menu, as well as directly on this Website. Successful Business requires professional management. See the Workshops menu for detailed information on how to select the perfect Business Model for your first very own Startup. Photovoltaic System. The perfect Number of PV Panels for your own house. Return on Invest. Internet of Things developer. Worldwide Expansion. Transparent ToolTips. Privacy protected. Your first Business Plan in 10 Steps. Your free do-it-yourself Business Planner Tutorial. Photovoltaic System, a Perfect Desire Simulation. 20-50 years. ToolTips for all Inputs and Targets. SocialMedia driven App Developer, a Perfect Desire Simulation. Startup Product Manager v2.56, predicting a small business, in light UI Theme. Dynamic Applications. Success is much about heading in the right direction over time. Follow your way to Success. Create your own intercative, 24/7 Business Planners. Your way to Success. thousands of customers around the globe are waiting for your solution. how can we achieve exponential growth on a realistic basis? free startup product calculators for worldwide deployment.